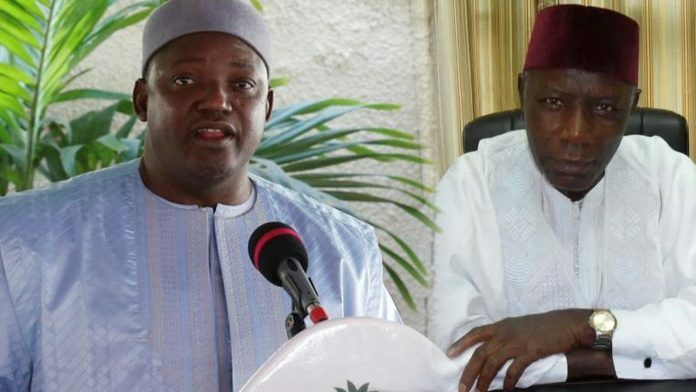 By Alalgie Manneh – Political parties in the Gambia registered by the IEC yesterday signed a Memorandum of Understanding, MoU that seeks to govern inter-party relations. Speaking at the signing ceremony at the Kairaba Hotel yesterday, President Adama Barrow said: “…This is a byproduct of our common desire to create a peaceful and stable political environment underpinned by transparent and democratic political dispensation without with the prosperity, happiness, and wellbeing of our people will be compromised”. Preident Barrow added the MoU is also designed to give dignity and respect to the office of the president, and encourage politicians to be partners in national development. He promised to do “everything within my powers” to support the committee, whose objectives he went on, is to “ensure we live in a society were dialogue and cooperation between political parties will serve as a key stone in the promotion and consolidation of democracy, rule of law, human rights and good governance in the Gambia”, he concludes. Speaking earlier, the chairman of the IEC, Alieu Momarr Njai, hailed the integration of Gambian political parties. “How they [political parties] conduct themselves on the ground would determine to a large extent the quality of elections we could deliver,” Mr Njai said. Eight political parties UDP, PPP, GPDP, NCP, NRP, APRC, GDC, PDOIS, signed the MOU.